﻿ How to Personalize Emails Based On What You Know » Red Mango Marketing! Think of your favorite customer. With every visit your knowledge of this customer grows and grows. The first time they shopped at your business you discovered what products they like; the next time it was the name of their dog. Now, you know what they do for a living, how they say goodbye with some well-timed finger guns, and why their dream of having a puppy was never fulfilled. (They’re allergic). This knowledge is where the power of a small business lies and where no large business, even with a seemingly endless marketing budget, can come close. You can use your special knowledge of your customers to talk with them one-on-one in your email marketing, taking your personalization to the next level. Join us for a free webinar, How to Create More Personalized Email Messages. Why would you want to use what you know in your emails? Of all the marketing you see all day, every day, which ones actually make an impact? Personalization can help your marketing rise to the top by speaking directly to your potential customers. It’s easy to tune out a conversation that you’re not involved in, but think of how fast you start to listen in once you hear your name. The same can happen with marketing. Even just mentioning your customer’s name in the subject line of an email can boost open rates. If you only have a few chances a day to grab the attention of your customers, you need to make sure you’re doing everything you can to make an impact. No matter how many new customers walk through your door, the ones that have been with you the longest are what keep you showing up early and staying open late. Reward that loyalty can help to keep them coming back, and can spread more loyalty via word of mouth when they tell friends about their special loyalty discount or reward. Keep a record of the first time customers shop with you, visit your store, or sign up for your email list. Setup an automated message that sends them a special message and gives them some reward or an incentive that gets them back into your store. These emails work because customers don’t expect them and it shows how much you truly appreciate their business. After all, the lights couldn’t stay on without customers like them. Of course, as with anything, you can go too far with personalizing emails to people you know. Getting an email detailing my specific morning ritual, down to how many times I pet my cat before leaving for work (twice), would make me throw my computer out the window too. Imagine getting ice cream on a warm, summer afternoon. As you pay for your two scoops of vanilla, you notice a survey next to the register asking what your favorite potato chip flavor is – interesting right? A month later, you get an email from that ice cream shop with the results of the survey. Not only was your flavor one of the three most popular picks, but you can try all three in ice cream form right now, for a limited time. I’d try salt and vinegar ice cream at least once. Personalizing your email marketing based on your customers’ likes and behavior can make your marketing more interesting and even set your business apart from the rest. Personalization can be a powerful tool that lets you test different messages with smaller groups of your customers, without the risk of turning other people off from your business. If running your business has been your main focus, not getting to know your customers as well as you’d like, then now is the time to start. Not only will it make each interaction with your customers, more enjoyable, it can also help spur more revenue. Start chatting with your customers, stage a get together for local clubs and organizations, or partner with other businesses; anything that can lead to more interesting conversations. Make sure you have a system to manage contacts in place, even if it’s just a simple spreadsheet, and add notes beside each customer as you learn more and more about them. Even if the information you’re learning doesn’t seem to do with your business, down the road you may find that specific piece of personalization is exactly what’s missing in your marketing. Want more tips on personalization? Join us for a free webinar, How to Create More Personalized Emails. 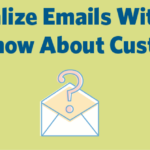 The post How to Personalize Emails Based On What You Know appeared first on Constant Contact Blogs. This entry was posted on Wednesday, March 14th, 2018 at 8:00 am	and is filed under Email Marketing, News & Updates. You can follow any responses to this entry through the RSS 2.0 feed. Both comments and pings are currently closed.